Patron enjoys a donated house built by artisan Liz LeBosse. Membership allows you to bring the family as often as you like. 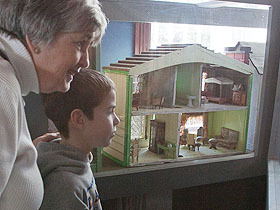 The Great American Dollhouse Museum welcomes the donation of dollhouses, dollhouse furniture, antique and artisan miniatures and other objects of historical significance. 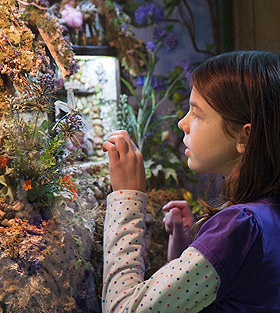 To discuss a donation, please contact us at info@TheDollhouseMuseum.com or (859) 236-1883. Please click here for a printable PDF application form. Half-scale quilt shop donated by the family of miniaturist Joan Howard.